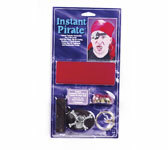 Skull Eye Patch, Clip-On Earring, Bandana, Teeth Denture. Teeth Denture ncludes impression putty for a custom fit every time! Talk, eat and drink naturally and comfortably.